Mayapple (Podophyllum peltatum) is an easily recognized native herbaceous plant of rich open woodlands in eastern North America. In early spring, the emerging leaves of Mayapple appear like small green umbrellas dotting the forest floor and give rise to another of its common names, Umbrella Plant. Within a few weeks, these umbrellas grow into a dense groundcover that stands about one to two feet tall. An individual Mayapple plant can form a large clump, with up to 1000 stems. Look closely at a clump and you will notice that the stems are of two different types. One type of stem is topped by a single, large, umbrella-like leaf and has no flowers. The second type of stem is forked and bears two smaller umbrella-like leaves. Growing from the fork of these branched stems, and hidden by the leaves, is a single, nodding flower that blooms in May. The waxy, white flower, about two inches in diameter, has six to nine petals that look a bit like saucers. Mayapple has large, showy fruits that mature in midsummer. The yellow, fleshy, egg-shaped fruit is about 1.5 to 2 inches long and gives rise to the “-apple” in Mayapple as well as other common names like Hog Apple and Wild Lemon. The fruit is a favorite food of animals, especially the Eastern Box Turtle (Terrapene carolina) that can reach it from the forest floor. 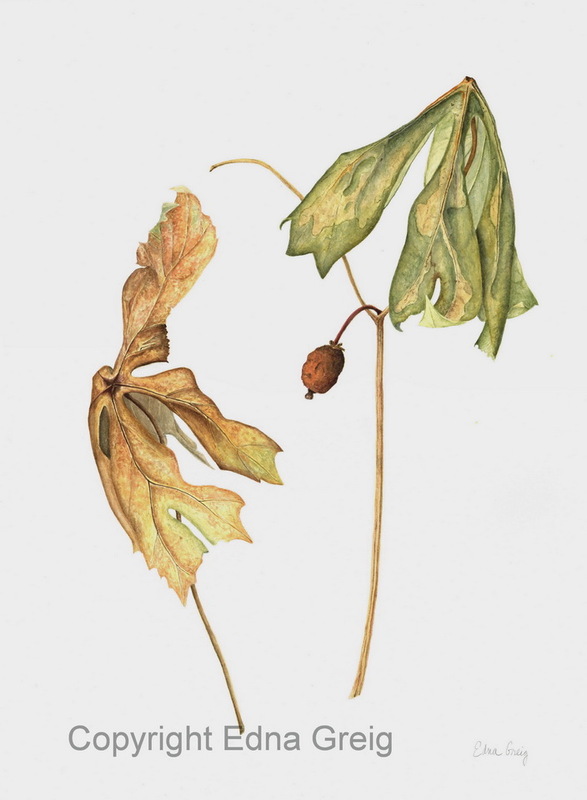 By late summer, the leaves of Mayapple start to turn yellow and brown and any uneaten fruits shrivel and darken. Copyright Edna Greig. All rights reserved.